Who says good things don't come in small packages? The ultra-portable World's Smallest Automatic Umbrella is a take-anywhere solution to keep you dry. This umbrella is small enough that toting it doesn't add any inconvenience to your daily carry, whether you keep it in your purse or bag, and it even fits in a pocket. 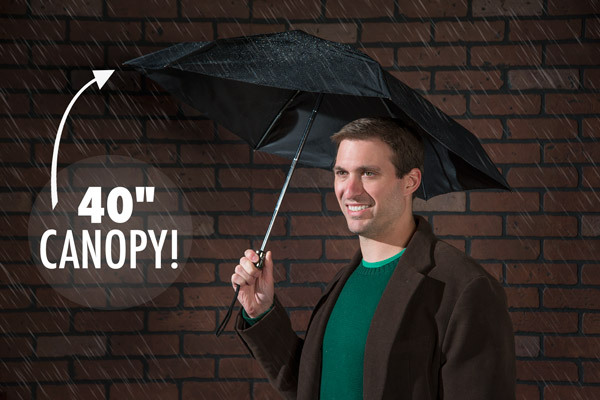 While it's incredibly compact, it's also a fully-functional and automatic umbrella. When the skies open up, a single button press automatically opens the generous 40" canopy. Six nylon panels shed rain away and keep you fully dry. When the sun peeks out, a second button press collapses the canopy. If the World's Smallest Umbrella were any tinier, you wouldn't be able to find it. And then you'd get wet. Auto-open and close at the press of a button! It’s Auto-Matic! And super compact! No matter where rain strikes, stay dry with The World's Most Compact Automatic Umbrella. Tap the single button on the handle and the umbrella (only eight inches long!) opens its generous canopy (forty inches across!) with lightning-fast speed. When you reach your destination, just tap the button again and the six-panel nylon canopy collapses. You can then stow your ultra-portable umbrella in your purse, backpack, or even your back pocket! The World's Most Compact Automatic Umbrella springs into action when spring has sprung. The classic black umbrella with gunmetal handle is elegant enough for any occasion. So when you make your entrance, don't be surprised if a few necks snap as you snap closed your über-compact umbrella. If James Bond had an umbrella (and enjoyed brown blazers atop green sweaters), this would be it. The sturdy steel construction of the umbrella means that you are ready for whatever mother nature throws at you. From a slight drizzle to cats and dogs, this umbrella has you covered. 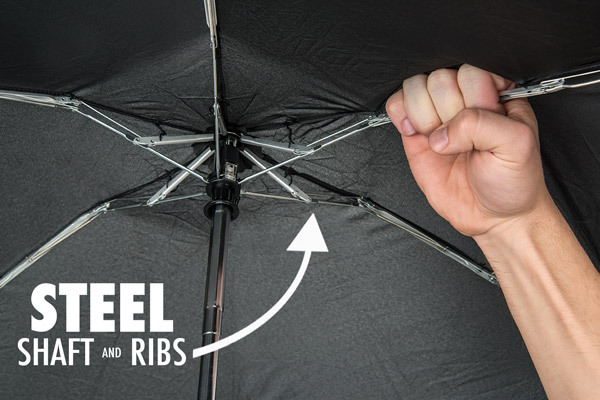 The World's Most Compact Automatic Umbrella is built to handle the elements with steel strength.